I think my boys are outgrowing Parkdean, perhaps that, or the Southerness Parkdean wasn’t for us. There was nothing wrong with it as such, but there just was not enough for us to do in a short distance from it. It is isolated in the south west of Scotland and without a decent supermarket, filling the fridge is expensive, unless you can face the 30 mile round trip to Dumfries. Before I go further into this post, I think I need to make it clear that I dislike holiday camps. Usually because I feel fleeced by grumpy staff that don’t care. At Southerness, I didn’t find any reason whatsoever to fault the staff. Other parks could learn more than a lesson or two in customer service from their attitude. They have that nailed down. We’d visited Grannies Heilan Hame a few times but after our first visit there, we decided not to try eating in-house any more. We did try the fast food place last year but gave up that as kids wouldn’t eat their food. We’ve tried two Parkdeans before Southerness for food, and both left us disappointed. Not so with Southerness. Their food was pretty good. We tried the buffet carvery on the Sunday although I didn’t get any photographs of the plates of food. We’d not booked as we didn’t realise we had to, but they squeezed us in. The carvery wasn’t what I would think of as a full carvery with simply 2 roasts, roast potatoes, boiled potatoes and mixed carrots and peas to go with two choices of gravy. I’m more used to the type of carvery that has a choice of vegetables etc, but the food was beautifully cooked, so that made up for the lack of choice on the buffet. We also tried a meal during the week which was lovely. My chicken burger was gorgeous, the kids were all happy and though the man wished for a bigger plateful, he was happy enough with it. It was a completely different food experience to the ones we’ve experienced before at Parkdeans. Yes that really is a kids portion of hot dog. His eyes sparkled. Southerness has its good and improvement points, but on the whole, it was a much better food and staff interactive experience, and that makes one BIG difference to the experience. Last year we’d splashed out on one of the most expensive statics at Grannies, but this year, we’re holidaying in the camping section which is a whole different ball game. I missed the sea view from this time last year, but for £400 less, it’s not surprising the pitches are well away from pretty views. We weren’t exactly roughing it in a motorhome, and the toilet block for the camping is beautifully kept and among the cleanest I’ve ever seen, and that’s including the Caravan Club sites, BUT the taps are very powerful and fast and mess up the gorgeous shower block very quickly. Be warned, the showers soak everything. I didn’t twig why everyone heading for the shower block held a plastic carrier for their stuff, but now I know why. Once bitten, never again. The water comes out in a big circle, with the water round the outside but no water in the middle, so it’s like a hat where the edge of the brim is the only place the water goes. Trying to get enough water on my head to rinse off shampoo was not cool, yet the shoes I wore to go to the shower block got wrecked. I should have known when the drains were on the OUTSIDE of the shower cubicle, but there was no warning that EVERYTHING inside the cublicle will get sodden. That includes anything you hang up on the pegs. I can imagine many pairs of shoes will have been trashed this way. I just hope campers all come with spare shoes and don’t take a chance on just one pair. Yes, jammies, shoes, toiletry bag, jacket – ALL wringing wet. There is meant to be a changing area in the cubicle, but the water flow from the shower makes such a big circle that it soaks that part too. My poor fitflop cloggs took a week to dry out fully. The siting of pitches was a disappointment, but I’m not sure what else to say, we were so spoiled last year with an expensive static with a seaview, that I guess any pitch was not going to compare. It was a piece of concrete with gravel at the side for an awning or pup tent. We gave up before we even started with the wind. We chose to pay it, but it was £21 wasted to not put a pup tent on the same site as we’d rented anyway. I can never understand why it costs one price to rent the site but need to add extra cost if you plan to actually use it all, but it’s pretty common nowadays in business demands to charge for every little thing. We’d caravans in front, behind and at each side with a loo block next to us that kids played around. We couldn’t see the closest play park so middler was a victim of his disability again, stuck with the adults and not able to have more freedom on his own. In the pack em in sites, pitches are often poor, so I came to terms with it after a day. The swimming pool here is quite nice and has flumes that pleased the kids. The arcades, like all arcades, are a pain. The kids moan for money constantly to throw into slot machines now that they’re older and that’s pretty much the only place they want to be. The main reason we come to these sites about once a year is for the kids. Middler has very little independence and holidays tend to be even more restrictive than being at home. He LOVES Sid and Lizzie. All 12, nearly 13 years of him. For his comfort this year, I’m glad there were some big brothers/sisters on the floor with the toddlers and pre-tweens, but even so, he still stood the tallest on the floor. He was itching to join in as it is the right show for the stage of his brain development, but he’s conscious of his height and it’s not the fault of the staff everywhere that he is always overlooked while they think he’s as old as he is tall. There are shows and kids clubs, but for some reason, my lot kept away this year. We went to the showbar on the Sunday night and it was pleasant people wise. I popped my head around the show bar on the Saturday night and decided it was too much for us. There was no wi-fi in the showbar. Can I say that again *sobs loudly*. It works intermittently in the restaurant and the noisy arcade. I’d been hoping to sit with middler while he joined in with the younger kid group, and potter on the Internet but that was not possible. It upsets me more than it should to be so out of touch with everything. No phone signal and no Internet is purgatory for me, and I don’t really drink alcohol so I find no fun in sitting with a near 13 year old watching shows for under 8s and nothing to do but read, as I like to read when it’s quiet. Stupidly, we left home without the kids jackets and it’s a blustery place at Southerness, with the nearest place for clothes miles away. I think we were lucky with the weather as they weren’t held inside, but I did cross my fingers a few times for good weather. The beach was grim. 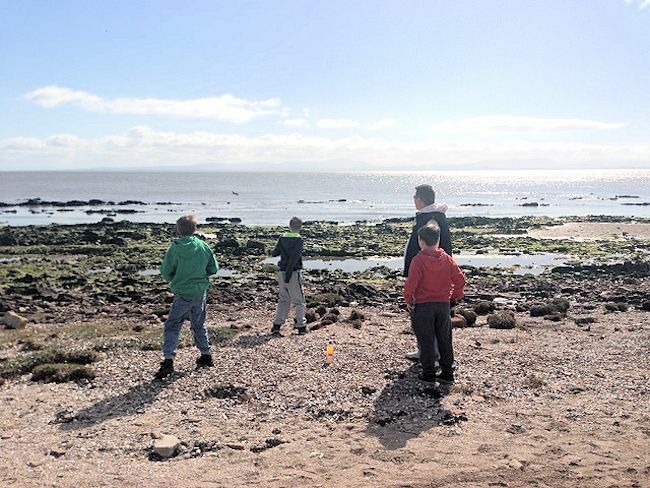 We met a man using a metal detector who was in his mint with the sludgy mud at one point along the beach, and the kids did enjoy some kicking around of the shells, shale and general muck on the beach, but it was filthy with a fair few dead birds washed up along it. Thanks for your informative e-mail regarding the above named voyager. These kind of voyagers are launched into creeks, rivers and oceans worldwide usually by vacationers. They are all allocated female names in the best maritime traditions. Waverider Teams are always delighted when there is news of a discovery . We hope it gave you some pleasure finding her. The Series M voyagers are proving themselves to be just as resilient as their predecessors and we are hopeful of many more discoveries. Kerstey M was one of a bunch of voyagers launched from various European locations . Data examination indicates that she was launched at 2345 hours on Sunday 1st December 2013 into the Cocker River at Scalehill Bridge just north of Crummock Water, Cumbria, United Kingdom. With three nights to go, we decided to up sticks and go for a run in the motorhome. We headed to the North of England and stopped off in a lovely site at Appleby in Westmoreland with zero entertainment, but plenty atmosphere. We couldn’t be bothered driving back to Southerness that night so stayed 2 nights. We did mean to head back to Southerness for the last night we’d paid for, but we just never got to it.